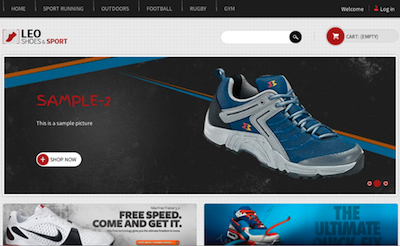 When I installed the sneaker shop theme I was quite impressed with it because of all the modules that are included. For example, it includes a Leo theme control panel, Lof advanced footer module, Lof custom top, Lof manufacturers scroll, Lof new products module and Lof social share module. In my opinion, the Leo theme control panel is the most impressive because it allows you to modify the template width (by entering a number that represents px or % value), change the default skin color, font, background pattern and more. There is even a responsive feature that can be turned on and off, but when I tried turning it on and tested it on both my desktop and iPhone, the theme didn’t seem to adjust to the screen size. Speaking of responsive, I’m a big fan of them as I’ve mentioned in the past in my responsive themes article. 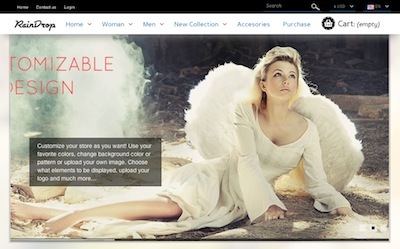 To sumarize, I like responsive design because they are a really great way to optimize your store for visitors on mobile devices. When I first wrote this article, I couldn’t find any free ones other than this one from Template Monster, but the terms state that the theme cannot be used for personal or commercial projects… Since that time I have found a few more — I mention which ones are responsive in the summaries of the free themes below. Unfortunately only 3 are responsive and another looks to be about 80% (rough figure LOL) responsive. 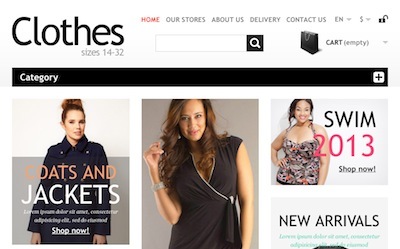 I was, however, able to find quite a few premium PrestaShop v1.5.x that are 100% responsive and you can view them here. 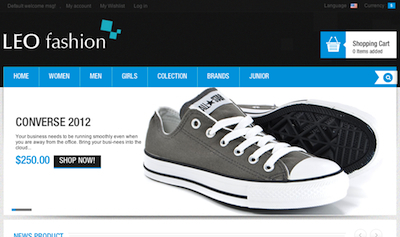 Here is a modern yet fun looking shoe store theme. I personally like the colors and the design because it keeps things simple yet colorful at the same time. 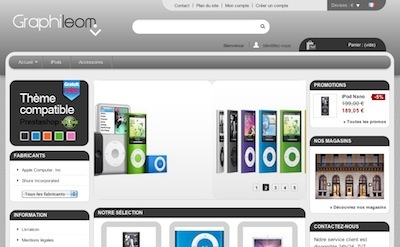 Features a 1 column layout for the homepage and a 2 column layout for other pages of the store. 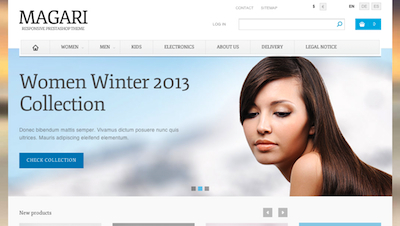 This one comes to us from PrestAddons which is offering this free 3 column layout theme. I like the sharp edges of this theme and I am also digging the way the search box in the header looks. The diamond pattern background also looks pretty cool and the gradient green buttons are a nice touch. Judging by the overall look and close attention to detail, it seems like the designer put a lot of work into this theme. Very nice to see this kind of work go into a free theme. This particular theme is listed as responsive but when I tested the theme, it was only partially responsive (at least on my Safari web browser) for example, the nav bar and product listings didn’t move down the page as expected. Other than that, I must say that the theme is modern looking and would work well with stores selling clothing. 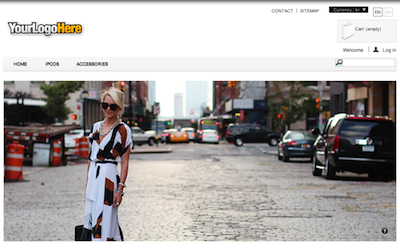 This theme features a 1 column layout for the homepage and a 2 column layout throughout the store. Courtesy of Devil Themes. This is one elegant theme that has a lot of detail in it. It really looks like something you would see on a high end website like the Louis Vuitton website. While the demo is of a perfume store, I think this can work with any product line that requires a little class. 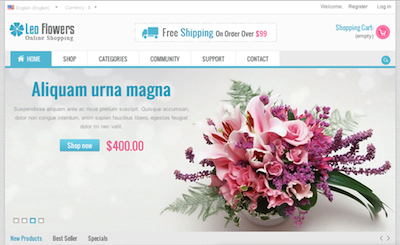 Features a 1 column homepage layout and 2 columns for the rest of the store. 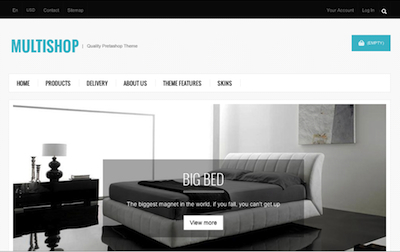 Here we have a theme from Presta Designer. Unfortunately, though, there isn’t a description or demo available for the theme. There is, however, a screenshot being shown and from the looks of it, the theme looks really nice. It has a nice bright design with cheerful colors throughout it such as orange but it also has a little bit of light brown accents which tone things down a bit. Here is a watches theme that has an urban look to it. Since the main colors are gray and black, the yellow accents seem to blend in well and keeps it from looking too dark. If I were to use this theme and didn’t have a store logo, I’d try to keep the look of the theme’s logo because it matches nicely with the yellow buttons. 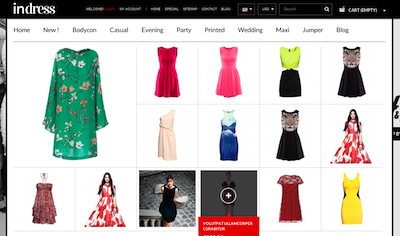 Features a 1 column layout for the homepage and a 2 column layout throughout the store. 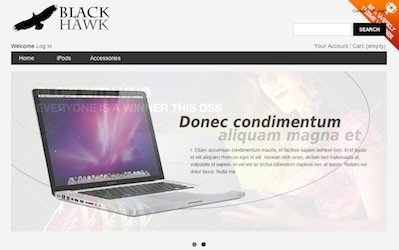 This theme comes to us from Devil Themes which is offering this free responsive theme. This is actually the 2nd responsive theme that I’ve found on the Devil Themes website but unlike the Fashion Bird theme which I reviewed earlier, this one seems to work a little better as far as responsiveness is concerned. The theme also seems like it would work great on a site that needs a simple design yet modern look. 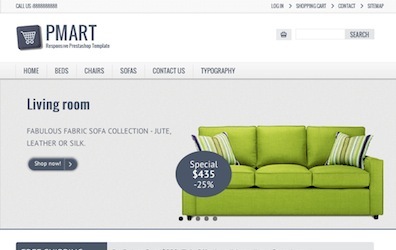 Features a 1 column layout for the homepage and a 2 column layout for the rest of the store. A demo for this theme can be found here. I’m actually quite impressed by this theme to say the least. Especially since it looks like something you would see on some big name store like Macy’s. 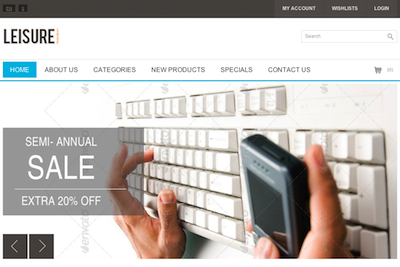 Best of all, it features a responsive design so the designer is really giving us a lot for free. Now I haven’t read the terms of the license so I don’t know if there are some restrictions on usage but I’d look into that if I were installing it on my site. 1 column homepage and 2 columns on other pages. 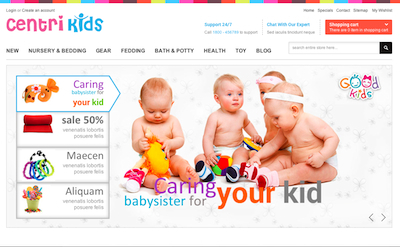 This theme comes from a French website that is offering this theme in other colors such as green, orange, blue and pink. The design has a high tech look to it in my opinion so if I were to use it, I’d use it for an electronics store or something like that. The theme features a 2 column layout. 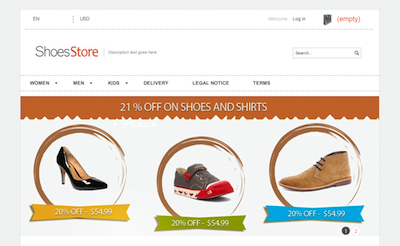 This theme is being offered by LeoTheme which is the site that offers the free theme Sneaker Shop which I installed in my video. While this theme may seem similar because it also seems to be geared towards stores that sell sneakers, it is a different theme all in all. 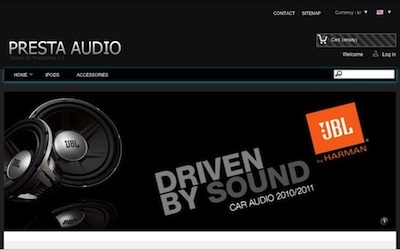 Best of all it’s responsive, lets you choose between quite a few different color schemes and is of high quality. Features a 1 column homepage layout and a 2 column layout on other pages. This is a nice, bright yellow theme that really gives off a cheerful feel. 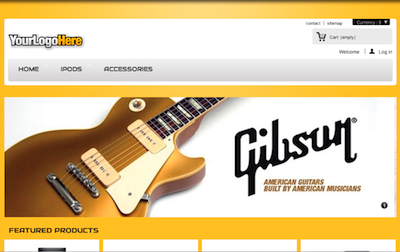 I really like how the guitar image on the homepage blends in with the rest of the colors. Storewide 1 column layout. 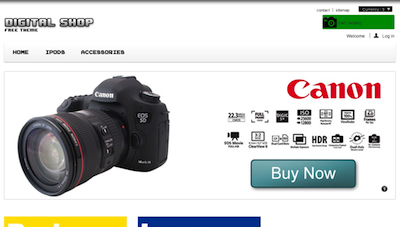 A clean theme that has nice little touches such as the camera image next to the cart link. This is a storewide 1 column layout. Beautiful green theme with a leafy background. Plenty of detail can be found such as an image of a green basket next to the cart link, an orange background for the side column (which I feel blends in well with the green color) as well as a gradient green background for the header navigation bar. 1 column layout for the homepage and 2 columns for other pages. 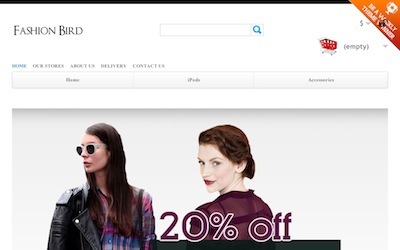 Are you in the clothing business? Well, if you are, you’re in luck because this is one chic looking theme. Nice crisp white background with gray and blue buttons. 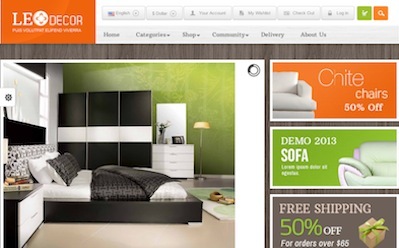 Features a 1 column design for the homepage and 2 columns for the rest of the site. 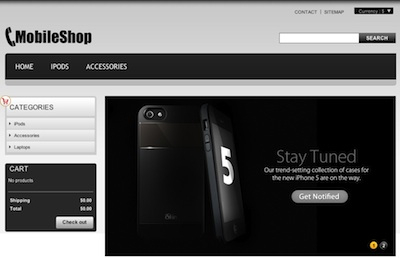 If you’re in the cell phone and/or accessories business, this theme is sure to give your shop a cool high tech look. The gradient gray and black design is definitely a nice touch. Features a 2 column layout. I really like the choice of colors on this theme. Also, isn’t it cool how the aqua blue border around the top nav bar looks as if it’s illuminated? As someone that’s really into carbon fiber, the background for the shopping cart button in the top right and side navigational box really caught my attention. Features a 1 column layout for the homepage and 2 columns for the rest of the pages. It’s playful and fun all at the same time and looks very professional. Just perfect for a children’s store. Features a mega menu, quick search, slideshow and more. This theme was designed by LeoTheme and if you are familiar with their work, you already know that they have some nice themes out on the market. This theme in particular doesn’t disappoint and would really compliment any store selling that sells tea, food, herbs and similar products quite nicely. A lot of extras such as mega menus, Google fonts and more. If you’re operating a store that sells furniture, fixtures or other home decor items, this theme is sure to give your store a very nice modern look and feel that at the same time looks classy. I personally like the way the homepage has a Pinterest-like listing display and dig the wooden background. If you are looking for a bright modern look, this theme delivers. It actually reminds me of the new Windows look or maybe a tiny bit like the Google Play store. Now if the default colors aren’t your thing, there are some other color schemes available such as black, grey and what looks like brown as well as a blue and pink look. 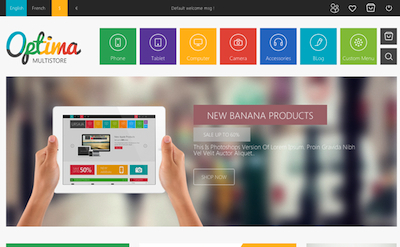 The theme is built using CSS3 and bootstrap 3, features ajax layered navigation, a mega menu and more. This theme comes in blue, green, orange, red as well as a boxed style which I personally like. 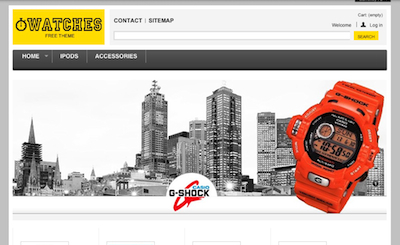 A “quick shop” feature which shows you details about a product at the click of a button while you are on a category page. This I like because it eliminates the need to load the product details on another page and then having to click the back button on your browser to view the category page again. Other features such as grid or list view for product listing pages, mega menus, camera slideshow and more have been added. 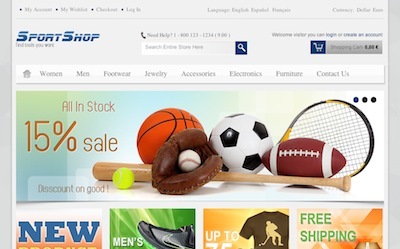 If you’re running a shop that sells sports equipement, jerseys, sneakers or similar items, this theme is sure to give your store a nice professional look quite fast. 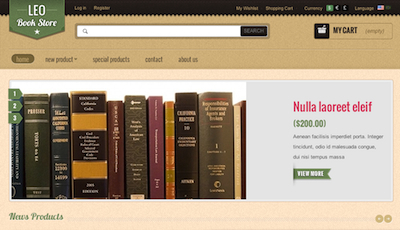 The theme features an Ajax product search feature that basically shows you relevant items as you type. Nice thing about this feature is that an image is shown in addition to the title of the item. Other options such as the ability to choose how many products are displayed in each row of category pages, cloud image zoom and more has been added. 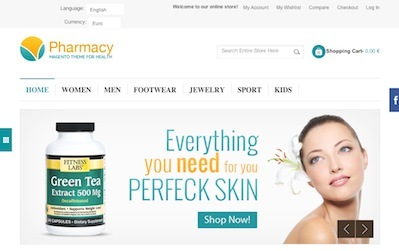 If you’re looking for theme that can compliment an online pharmacy or store selling health supplies or supplements, this theme may be the perfect choice. The theme offers the ability to display your latest Tweets from Twitter, has a customizable homepage which lets you choose between different layouts, utilizes HTML5 and CSS3, includes hundreds of Google fonts and more. 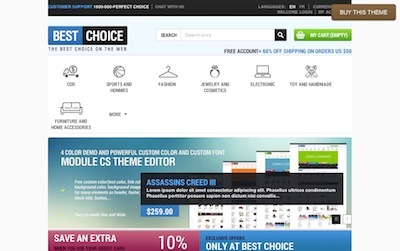 RainDrop is a killer theme that would look awesome in just about any store that sells clothing. I am just in love with the elegant look of this theme and all the extras that are included. For example, I really dig how products are displayed on the homepage and how they pop off the page and display a snippet of the item’s description when you hover over any of them. If you’re running a gift shop or store that sells baskets, stuffed animals, balloons or similar products, this theme will be sure to put a smile on your customer’s faces. In addition to this, the theme lets us tell our customers a little bit about our personalities by providing us with a way to upload custom background images to our store. Fortunatley for us, it doesn’t end there since we can also choose between different color schemes, Google fonts and custom menus. I mean what good is it to have our own stores if we cannot express ourselves, right? On the Leo Decor theme I mentioned how the homepage reminds me a bit of Pinterest. Well this particular theme was designed to look bit more like Pinterest (well at least judging by how the boxes are laid out). What’s nice about the theme is that it has an infinite scroll feature. If you don’t know what that is, it’s something you may have seen on Facebook, Overstock and other sites. It basically loads additional products from your store as you scroll down the page and therefore eliminates the need to view additional pages. In a way, this might get your visitors to stick around on your site longer or might get them to view more products because they won’t have to keep clicking the next button to view other pages in your store. Here we have another theme that offers a nice crisp, clean look that also has some nice bells and wistles. For example, it has a store locator which is great for those of you with physical stores, unlimited color variations, social media support, 8 background colors and variations to choose from, slideshows and more. Customizable design that let’s you change the color of the bottons, footer background, header, font and more. I was actually playing around with some of the included modules and really like the big product slider and manufacturer editorial section. I also like how the the layout of the homepage changes when you turn certain modules on and others off via the theme’s configuration panel. 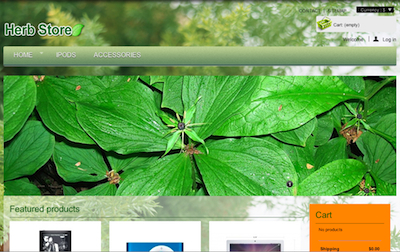 Personally, I like the way the store looks with the big image slider turned off and the big product slider turned on. 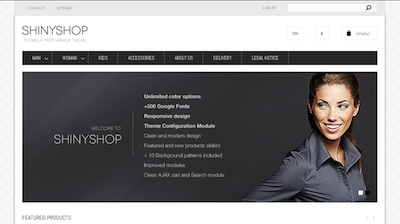 The Shinyshop theme includes +10 background patterns, allows you to change your store’s colors, font and includes a couple of Ajax modules. I was playing around with the modules because at first I didn’t understand what they do and later realized that the search module offers instant search suggestions while you type into the search box, and the shopping cart module displays the contents of your cart when you hover over the shopping cart link (cart must contain items for the menu to show). 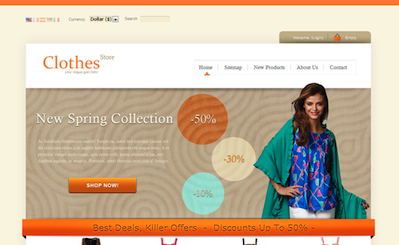 Multishop features a clean design and is packed with modules such as the responsive flexslider; Ajax cart which allows you to preview the contents of your shopping cart by hovering over the shopping cart link in the top right (like the module that is included with the Shinyshop theme); carousel display for brand, new products, featured products; drop down menu and more. 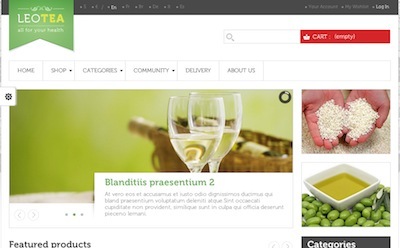 Modern looking theme that displays products in list and grid format. On the product listing page you will also find a product filter in the side box which allows you to filter items by color, price, attributes, specs and more. 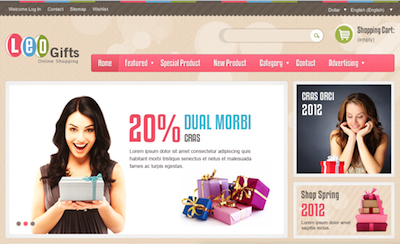 Theme design is also customizable and even allows you to enter in your own custom css code. A very nice looking theme with bright colors. 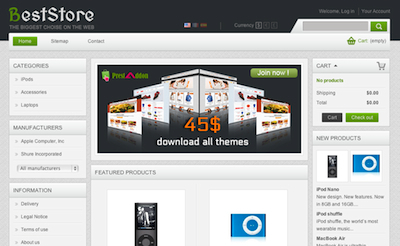 Modules are also included and amongst them you will find a theme control panel, review system and more. If I was selling flowers, I’d definitely choose this theme. It looks great with the default pastel color scheme and there are quite a few other color combinations to choose from. Numerous background patterns are also included. I’m a big fan of the contemporary look and this theme doesn’t disappoint. Personally, I like the default orange color because it really gives off a cheerful feel but for those that want to tone it down a bit, there is a “dark” color combo which isn’t at all gloomy (it sounded like that to me) that can be used. The Leo book store theme has a nice modern yet conservative feel to it. The default color (green and light brown) looks great and reminds me a bit of Barnes & Noble, but if you are looking for something a bit different, there are 3 other color combinations to choose from — cyan and gray, orange and tan, as well as red and blue. Judging by the demos, this theme seems to work well with shops selling clothing, watches, gadgets and flowers. There are also many customization options such as changing the font and button colors, background pattern for the header, footer, and more.